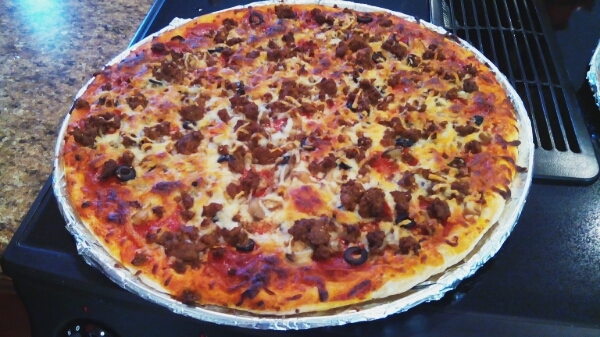 Nothing tastes as good as a fresh, hot, homemade pizza! Friday nights are pizza night at our house. We ditched the fast-food pizza years ago and started saving money and our health by making it at home. Homemade pizza is not hard to make. I can made a large and small pizza from scratch, start to finish, in just under an hour, about the same amount of time it would take to call and order a delivery pizza. The best part about making your own pizza, aside from saving money and the health benefits, is you get to choose what kind of toppings you want and how much of them you want to add….at no additional cost 😀. 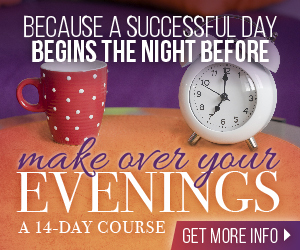 First you need to preheat your oven to 425 degrees. 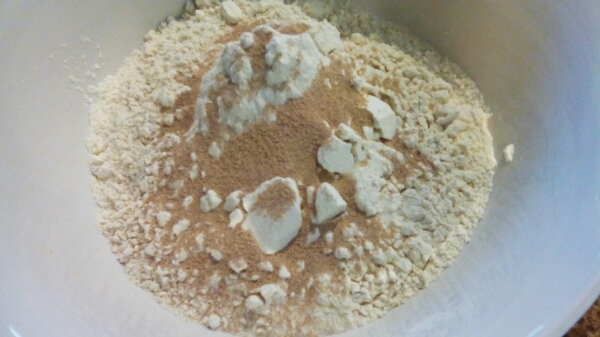 Next, mix up your dry ingredients in a mixing bowl: flour, instant yeast, and salt. I don’t add oil to my crust. It keeps it nice and light and fat-free. Next add the water and mix it into the dry ingredients until it forms a soft dough (I didn’t get a picture of this). Start with 3/4 a cup. If the mixture is too dry keep adding warm water a little bit at a time until the dough is soft and comes together. Then you want to decide how many pizza you are making. I make a large pizza for my husband and a small pizza for me. This gives us plenty of left overs. To make two medium pizzas, divide the dough in half. To make one large thick crust pizza don’t divide the dough. To make two large pizzas you will need to double the recipe. You get the idea. Just play around with how thick or thin you want your crust and how many pizzas you want to make and divide your dough accordingly. 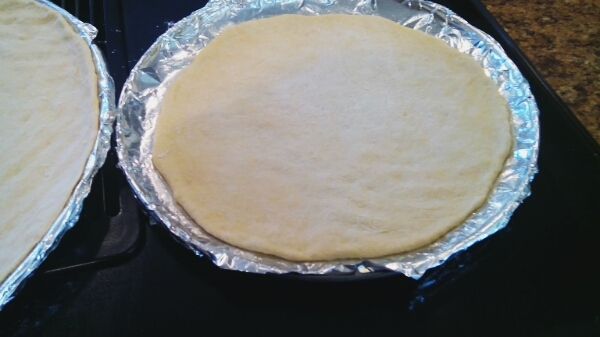 Roll out the dough on a well floured surface until it is big enough to fit the pizza pans. We like our dough at “hand-tossed” thickness, so I don’t let it rise. If you like fuller dough, let it rise for about 30 minutes or so. Now you want to top it with some sauce. 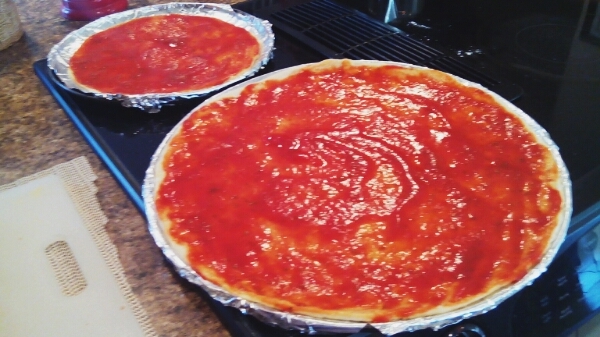 I make my own pizza sauce, but you can use store-bought as well. Top your pizza with what ever kind of toppings you like. Tonight we had supreme pizzas. 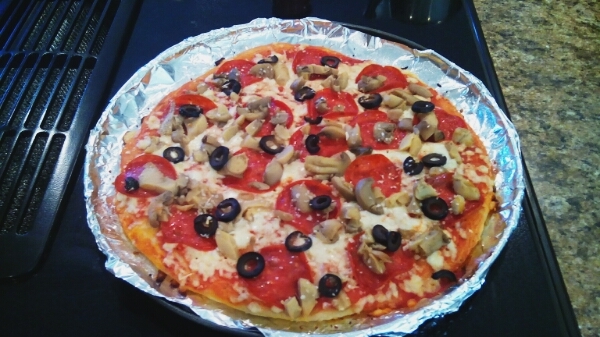 I like turkey pepperoni, olives, onions, mushrooms and my homemade cheese. My husband likes regular pepperoni, olives, mushrooms and cooked hamburger. We almost always have left over cooked hamburger from taco night. Use those left overs! Bake your pizzas in a hot oven at 425 degrees. My husband’s pizza gets cooked for 30 minutes and mine for 15. So, I put his in first and 15 minutes later mine goes in. That way they get done at the same time. After the pizzas are cooked, remove them from the oven, slice them and enjoy! For the sauce: 1 6 oz. can tomato paste, 1/4 tsp each garlic and onion powder, 2 tbsp. dried Italian seasonings. Whisk the tomato paste with two cans(measure in the tomato paste can) of water. Whisk in remaining ingredients. Spread on pizza dough. 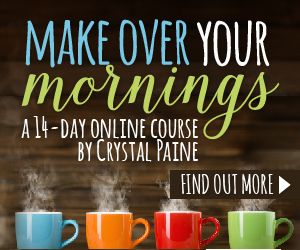 First you need to preheat your oven to 425 degrees. Next, mix up your dry ingredients in a mixing bowl: flour, instant yeast, and salt. Add the water and mix it into the dry ingredients until it forms a soft dough. Start with 3/4 a cup. If the mixture is too dry keep adding warm water a little bit at a time until the dough is soft and comes together. 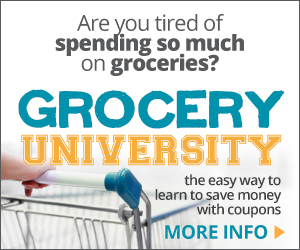 Decide how many pizzas you are making and divide your dough accordingly. 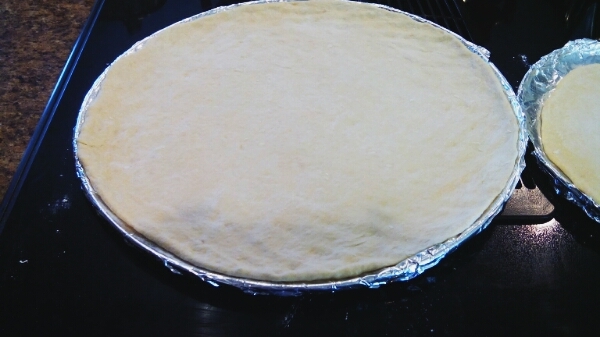 Roll out the dough to a thickness that you like and large enough to fit your pizza pan(s). We like our dough at “hand-tossed” thickness, so I don’t let it rise. If you like fuller dough, let it rise for about 30 minutes or so. Spread pizza sauce on the dough. Add your favorite toppings. Bake at 425 degrees for about 30 minutes. Keep an eye on it and cook it until the crust is as brown as you like and the cheese and toppings are cooked as much as you want.